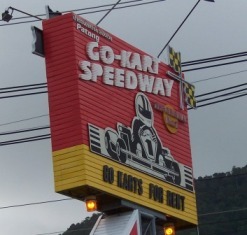 The Go Kart Speedway in Patong is loads of fun, for both young and old. 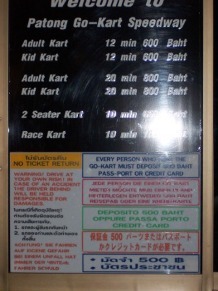 Then why not have some fun at Patong Go-Kart Speedway, a great day of fun for the whole family. With 27 karts from 140cc to 400cc there is a kart for all ages; including kids karts, two seater and standard single karts that sit 5cm off the ground. The Speedway is open everyday until late and has a 50 seat viewing restaurant with ample parking. 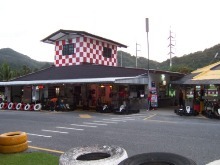 Patong Go-kart Speedway has been trading since 1991, the racing track is 750 metres and is quiet challenging with lighting for night races. 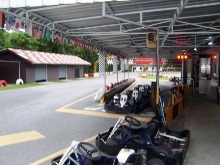 On a recent trip to Phuket we had a great time at the speedway, the kids and the big kids had a ball. If you have a group or corporate event, contact the speedway about organizing your very own grand prix. The Offroad Fun Park is located next door to the speedway, this track is a 600 metre Offroad Fun Park, where you can race custom built 300cc buggies. The buggies have rollover bars, disc brakes and full harness safety belts and are even safe for the kids. The track is floodlit and includes many exciting features as well as its own cafe that seats 50, serving snacks and drinks and a viewing area. 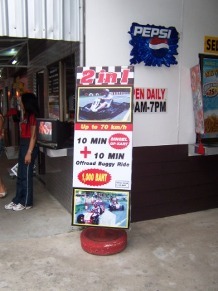 From Patong go 2 kilometres over the hill on Wichitsongkram Road, it is located on the right, just look for the Go-Kart Speedway sign.